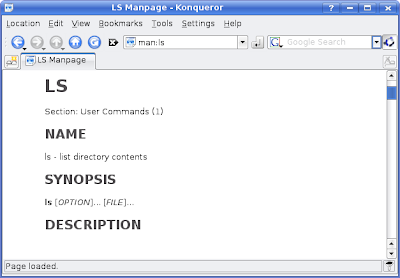 Konqueror is not only a web browser but also a good file manager designed as a core part of the K Desktop Environment. 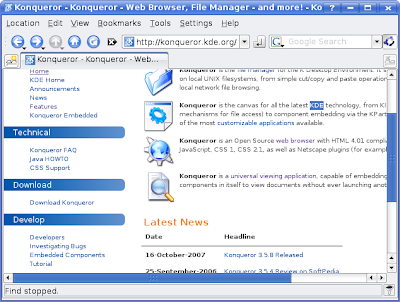 To be released under the GNU General Public License, Konqueror can run on many different operating systems including Ubuntu Linux. However, you can install this application easily in Ubuntu if you are missing it. What I would like to tell you in this article are the hidden features of this great application. 1. 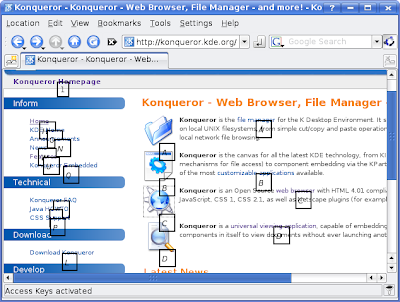 As a Web browser, Konqueror allows you to navigate easily a web site with access keys. You try to open a site with Konqueror, hit Ctrl key to activate access keys and you will see a bunch of boxed characters appear. Type any character you like to navigate the link. 2. You can access new websites in new tabs when calling Konqueror externally. For example, I want to open the website: www.kde.org, then I use this command. 3. Konqueror let you search text quickly using find as you type. For example, I want to search for "KDE" in the current web page, just hit "/" key and start typing "KDE". You can hit F3 to go to the next result. 4. Another score for Konqueror is the bookmark toolbar with a “View Most Visited” feature found under the View menu. 5. It's possible to scroll up or down with the auto-scroll feature of Konqueror. Just hold Shift key then press Up or Down key. Hit Shift key again to stop scrolling. 6. Like Firefox, you can use Ctrl + T to open a new tab in Konqueror. 10. As a terminal window, Konqueror allows you to read nicely formatted man pages. For example, I want to the ls man page, I have to enter this command to the location bar. And even more ideas for using Konqueror can be found by browsing its documentation. Press F1 to see the Konqueror Handbook!